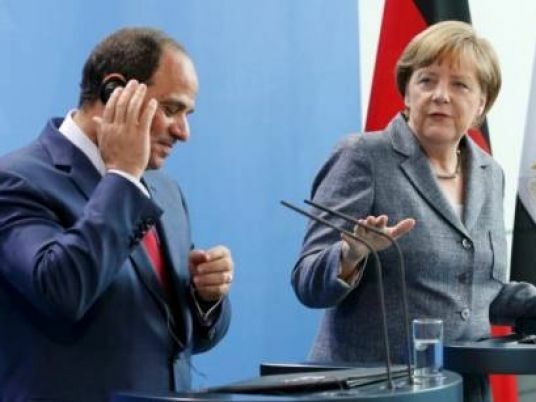 President Abdel Fattah al-Sisi, German Minister for Economic Affairs Brigitte Zypries, and Egyptian Minister of Industry and Trade Tarek Qabil will inaugurate on Monday the German-Egyptian Business Forum, on the sidelines of the conference organized between the G20 and African leaders in Berlin. The G20 include the EU, the US, the UK, Argentina, Australia, Brazil, Canada, China, France, Germany, India, Indonesia, Italy, Japan, Mexico, Russia, Saudi Arabia, South Africa, Republic of Korea, and Turkey. Egyptian officials who headed to Germany beside Sisi include Foreign Minister Sameh Shoukry, Industry and Trade Minister Tarek Qabil, International Cooperation Minister Sahar Nasr, Electricity Minister Mohamed Shaker, Chairman of the Suez Canal Authority Mohab Mamish, Sisi’s office manager Abbas Kamel, president spokesperson Alaa Youssef and others. The conference will discuss a G20 initiative which aims to promote private investment in general and investment in infrastructure in Africa. Egypt’s participation in the conference comes due to the importance it attaches to activating cooperation between African nations and the G20 in various development fields.